Sunday he was a freewheeling, vocal, profane, daring Governor — one of only 50 men and women currently serving that had achieved that distinction. Today he is disgraced, charged with high crimes, and the Supreme Court of Illinois has been asked to declare him unfit to serve. His marriage may be unwinding and his friends, if he ever had any real friends, are likely gone. He was visited this week by a group of churchmen: undoubtedly there was a call to God and some fear of suicide. We watch in a kind of mixture of horror, amusement and concern. Twenty-four hour news allows even the day shift to watch at night and the night shift to watch by day. It is human drama: the best kind. And much of it is live. Rod Blagojevich, it seems to me, is a kind of everyman. He didn’t go to Harvard and had none of the blessings of many others. He married well but he crossed his wife’s father which tripped him up. Above: Illinois Gov. 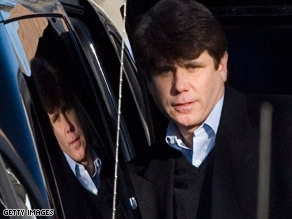 Rod Blagojevich was arrested this week on federal corruption charges. But he was more blue jeans than Brooks Brothers. He said he’d stand up for the union men and women because he was just like them. But then he betrayed their trust and now will suffer consequences. And he got in over his head: consumed, it seems, with greed and self. His ego, in the end, did him in. His ego and his mouth: both immense liabilities. If he ever had ethics and admirable character traits, if he ever had integrity; he gave them away or lost them or both. And he seems to have had no fear and no regard for his own safety and the happiness of his family: he even goaded the FBI and the Feds about recording his phone calls, saying he only spoke the truth. Which was a lie. One wonders what his children will think? And will he ever regain their trust and admiration? He doesn’t seem to deserve our hate or admiration. Rather; he is pitiable and bereft of qualities that earn anger or love, it seems. Barack Obama almost said he felt sorry for the man, a remark I at first misunderstood. Now I feel the same way myself. Rod Blagojavich will make a plea or he’ll go to prison for a long time, where he’ll undoubtedly be abused and suffer both mental and physical anguish. In any event, he is finished working as a lawyer and a politician, it seems, his family life is in disarray and dismay, perhaps damaged beyond repair. And he must set a new course of some kind and get on with life. That’s a challenge he doesn’t seem ready to accept: and that makes him even more pitiable indeed. You are currently browsing the archives for the pity category.